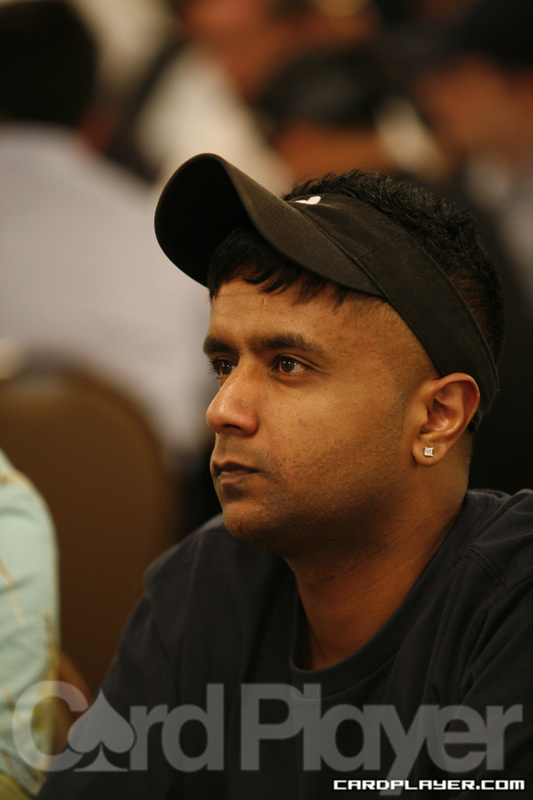 Praz Bansi raised to 225,000 preflop and the action was on Vincent Jacques. He moved in for 315,000 total and Bansi made a quick call. Jacques turned over A 8 but was dominated by Bansi’s A J . The board ran out Q Q J 8 2 and Bansi took down his second WSOP bracelet and a cool half million dollars to go with it. Calvin Kordus moved all in preflop and Vincent Jacques made the call. Kordus tabled A 5 and was dominated by Vincent Jacques A 8 . The board ran out A K 10 6 3 and Kordus made his exit in third place, leaving Jacques and Praz Bansi to battle heads-up for the bracelet. Donald Offord moved all in from the cutoff and Vincent Jacques did the same from the button. David Tuthill put in the initial raise but mucked his hand after all the action. Offord turned over J J but was dominated by Jacques and his Q Q . The board ran out A 7 10 10 5 and Offord was eliminated. David Tuthill raised it up from the cutoff preflop and Tomer Berda reraised. Tuthill put in a third raise and Berda came over the top with the rest of his chips. Tuthill made the call and turned over K K . It was the best hand as Berda showed down A K .
The board ran out 10 7 4 3 8 and Berda was eliminated. David Tuthill found himself all in holding A J . Praz Bansi made the call with K K .
The board ran out Q 10 7 6 4 and the one time chip leader at the final table was eliminated. David Sands moved all in for 575,000 and Praz Bansi reraised all in. No one called that bet and Sands showed 4 4 . Bansi turned over J J and the board ran out A A 9 A Q offering no help to Sands and he was eliminated. Hugh Bell put in a raise preflop and David Tuthill came over the top with a raise of his own. Bell called, putting himself all in. Tuthill turned over 10 10 but was dominated by Bell’s A A . The board ran out Q J 4 9 10 , giving Tuthill a miracle set on the river to eliminate Bell. Note: Players have gone on a 60-minute dinner break and will return at 8:30 p.m.
Praz Bansi raised to 76,000 from under the gun and action folded around to Kyle Knecht. He repopped to 171,000, putting himself all in. David Tuthill made the call and Bansi mucked. Knecht turned over K J while Tuthill showed 8 8 . The board ran out Q 8 3 5 A and Tuthill improved to a set on the flop to eliminate Knecht. The final table for event no. 5 is set. There were 23 returners on the final day and it took almost four hours to get down to the final nine participants. Here is how they stack up in chips. Stay tuned to CardPlayer.com as we bring you all the elimination hands from today’s final table. Day 3 of Event No. 5 ($1,500 no-limit holdâ€™em) will start today at noon PST. Day 2 experienced a plethora of eliminations. The current chip average is 410,673. A total of 23 players will take their seats later today, with only 9 of them making the final table. A winner will be crowned today. Stay tuned to Card Player for updates throughout the tournament.